Unlike most games like this on the Sega Master System, you aren't simply thrust into combat once you hit the start button. 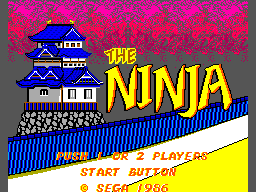 A back story is presented to the player, explaining why The Ninja is in the situation he is in. The levels are presented as an old Japanese style art scroll, where you move up the scroll as you go further through the game. When you first see the game, you might be disappointed, and we'll get into that later. But give it a chance, as it's gameplay is flat out a joy. Your character has the ability to shoot throwing stars at his enemies which can be upgraded by obtaining colored scrolls you can find in each level. When your shooting star is upgraded, you will notice your stars are not only more powerful, but larger as well. The power of your shots will only be noticeable on the bosses though, as all enemies only take one hit to kill. Unlike many games of this genre, enemies are quite varied and never feel terribly repetitive. 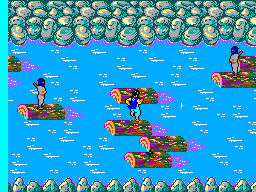 Each level seems to introduce either new enemies or vastly different environments to challenge the player. While you can be killed with only one hit, you never EVER feel that your death was unfair. It's one of those games where the difficulty is just right. It's a challenge, but it's not so challenging that you want to throw your pad across the room. If you die, you know what you did wrong, grumble to yourself about YOUR mistake, and try again with your next life. If you do lose a life, you will lose any weapons upgrades you obtained by picking up scrolls. This is another huge incentive not to die. Again, while this doesn't matter with regular enemies, it makes bosses infinitely easier to kill. You also have the ability to disappear by hitting both 1 and 2 at the same time. This is what truly makes the game perfect. Automatically, you have a feature where if you are in trouble, you have a shot at life if you're fast enough to execute the move in time. This makes levels like the river/log level much easier, and presents a whole new challenge as well to the player. Another feature is the ability to shoot while strafing. I cannot tell you how much better the game is because of this. Games like Rambo fail because of this omission, and this game truly shines because of it. If you hold the button down, you will not only be able to strafe, but shoot forward while walking side to side. When you first see the game, you will be disappointed. I can honestly say from personal experience, I almost passed on this gem of a game purely because it looked very basic. Animations are fluid and smooth, but fairly cheesy looking, and while there is plenty of detail in objects and characters, sprites are fairly small and the ground is usually poorly represented as a solid color, and doesn't ever really look like grass or dirt. Where the beauty suffers though, the varied levels shine. You'll see a host of unique looking levels, which changes gameplay enough to keep the game fresh. You'll always be forced to stay on your toes, and it's because of this that the game is such a joy to replay again and again. Unlike many games that play like this, you won't see what the whole game will offer within the first 5 minutes of play. It's this incentive to see future levels that will have you coming back for more. The sounds and music are great in the game. You are presented with a slower paced score while playing in the beginning. When your weapon is upgraded with a scroll, you will immediately notice the music changes to a more "happy", upbeat score. Boss music is good as well, and is a nice way to alert you one is coming. Controls, like mentioned above are amazing. For a two buttoned control pad, this game makes perfect use of them. One button to shoot, one button to strafe and shoot, and both to disappear. It's easy, intuitive, and never hinders in gameplay. You will never blame controls for your death. 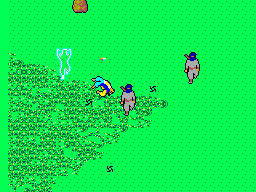 Deflecting enemy shots is easy... MUCH easier than in Rambo, and the game as a whole feels VERY well programmed from a control perspective. This game, along with a handful of others, is one of the best examples of best replay value for a SMS title. Unlike in Rambo, you will get better with each run, and you never get frustrated with the game to call it quits for good. The game will be powered on quite often, and deservedly so. On a shooter like this, control will either make or break the game. Graphics are always a treat, but if it doesn't control well, the game will not be worth it. Sega realized this early on, and delivered. The game is never cheap, and is a blast to play. Animations and graphics are cheesy, but the slew of enemies you will encounter, and the varied levels you will see, make this game make up for any lackluster graphical presentation. Bottom line: this game is a must have in anyone's collection, big or small. It's a must have not for rarity, but because it's fun. One of the best examples of fun on the SMS' entire library. If you don't try this game, you will have missed out on one of the best exclusives this system has to offer. Do yourself a favor, shell out 5-10 dollars, and get this as soon as possible. You'll thank me later... that is if you're able to tear yourself away from the game.